Gift baskets are the perfect way to show a person you care, and they are perfect for just about any occasion. Whether you make your own basket filled with their favorite yummy treats and items, or buy a pre-made one containing things they will love too, you can't go wrong. A beautiful basket filled to the brim with candles, chocolates, and bath products surely would make my day! Wine Country Gift Baskets offers a wide selection of gift baskets for many different types of occasions including holidays, birthdays, thank you's, congratulations, housewarming, new baby, and so many more. The gift baskets have fabulous items in them and are arranged so beautifully. I'm sure you'll find the perfect basket that fits your needs. I was sent a basket called "The Connoisseur" to review. A beautifully handcrafted basket is piled high with Godiva milk and dark chocolate truffles, Sonoma Jacks garlic herb cheese spread, olives, Ghirardelli milk chocolate with peanut butter and dark chocolate drops, Bavarian style pretzels, gourmet snack mix, Lindt dark chocolate truffles, Rocky Mountain Chocolate Factory dark chocolate covered Bavarian pretzel and peanut butter pail, and Lily O'Brien's double chocolate chip cookies. The included cheese knife and bamboo cutting board are ideal for preparing and serving this gourmet gift collection. WOW! This basket is just simply fantastic!. I wanted this basket for my family to have together on Mother's Day. Family, warm conversation, and snacks are the perfect trifeca. 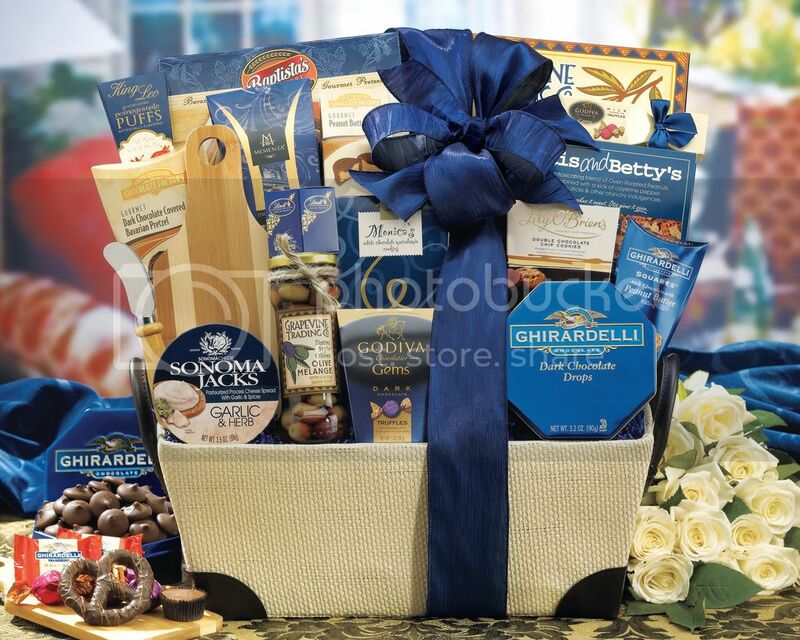 the basket is beautifully arranged with a large dark blue bow completing the glorious package. My family hasn't had any of the snacks yet as we are waiting until Sunday. It might be hard for them to control themselves from all of the delicious goodies though! Just seeing that the basket contains Godiva and Ghirardelli products sent my tastebuds into a potential chocolate overload! YUM! I've had candies from these companies before and you can expect only simply the best. I'm sure everything else will be simply fantastic too. The basket would be great to use afterwards for storing items in a garage, basement or closet. Send this basket to a loved one today and watch them grin from ear to ear with happiness! of gift baskets and product quality is also very good.